Amazingly, my number one favorite soup, Tom Kah Soup, is totally feasible on my cleanse. In fact, aside from omitting the red pepper flakes that give it a nice spicy kick, I didn’t even have to adapt this one at all, to make it work on the cleanse. Admittedly, it is pretty basic, and as simple as throwing all these things into a pot together, boiling, and simmering. That is, a base of homemade chicken broth (that’s what’s in the salsa container) and water, Tom Kah soup paste from FuBonn (an ingredients check reveals no cleanse-crashing culprits! 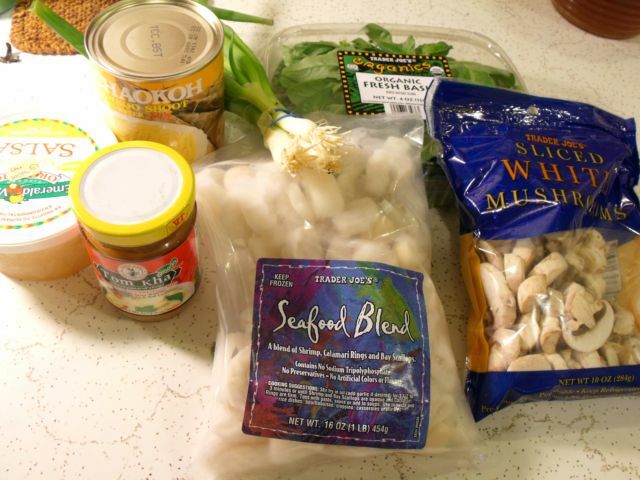 ), fresh mushrooms (normally I don’t buy pre-sliced mushrooms, but I was already at TJ’s and there they were, just as cheap as all the others) half a bag of Trader Joe’s seafood blend, bamboo shoots, fresh basil, and green onions. 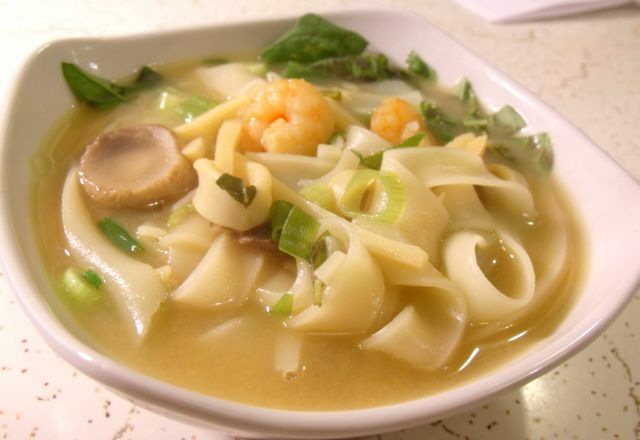 I first let the broth cook down with the mushrooms, soup paste, bamboo shoots, and seafood. Then I added some coconut milk, and some wide rice noodles at the end, so that this soup would be filling enough to have as a meal, which is fortunate because it’s still been 50 degrees and pouring rain all week long. Portland’s soup season is a long one.